All content of this site, unless otherwise noted, is copyright ©2001-2013 Robert Bly. All Rights Reserved. Any duplication, in any form without the written consent of the copyright holder is prohibited. 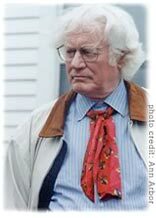 Robert Bly was born in western Minnesota in 1926 to parents of Norwegian stock. He enlisted in the Navy in 1944 and spent two years there. After one year at St. Olaf College in Minnesota, he transferred to Harvard and thereby joined the famous group of writers who were undergraduates at that time, which included Donald Hall, Adrienne Rich, Kenneth Koch, John Ashbery, Harold Brodky, George Plimpton, and John Hawkes. He graduated in 1950 and spent the next few years in New York living, as they say, hand to mouth. Beginning in 1954, he took two years at the University of Iowa at the Writers Workshop along with W. D. Snodgrass, Donald Justice, and others. In 1956 he received a Fulbright grant to travel to Norway and translate Norwegian poetry into English. While there he found not only his relatives but the work of a number of major poets whose force was not present in the United States, among them Pablo Neruda, Cesar Vallejo, Gunnar Ekelof, Georg Trakl and Harry Martinson. He determined then to start a literary magazine for poetry translation in the United States and so begin The Fifties and The Sixties and The Seventies, which introduced many of these poets to the writers of his generation, and published as well essays on American poets and insults to those deserving. During this time he lived on a farm in Minnesota with his wife and children. In 1966 he co-founded American Writers Against the Vietnam War and led much of the opposition among writers to that war. When he won the National Book Award for The Light Around the Body, he contributed the prize money to the Resistance. During the 70s he published eleven books of poetry, essays, and translations, celebrating the power of myth, Indian ecstatic poetry, meditation, and storytelling. During the 80s he published Loving a Woman in Two Worlds, The Wingéd Life: Selected Poems and Prose of Thoreau,The Man in the Black Coat Turns, and A Little Book on the Human Shadow. His work Iron John: A Book About Men is an international bestseller which has been translated into many languages. 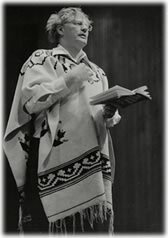 He frequently does workshops for men with James Hillman and others, and workshops for men and women with Marion Woodman. He and his wife Ruth, along with the storyteller Gioia Timpanelli, frequently conduct seminars on European fairy tales. In the early 90s, with James Hillman and Michael Meade, he edited The Rag and Bone Shop of the Heart, an anthology of poems from the men's work. Since then he has edited The Darkness Around Us Is Deep: Selected Poems of William Stafford, and The Soul Is Here for Its Own Joy, a collection of sacred poetry from many cultures. Recent books of poetry include What Have I Ever Lost by Dying? Collected Prose Poems and Meditations on the Insatiable Soul, both published by Harper Collins. His second large prose book, The Sibling Society, published by Addison-Wesley in hardcover and Vintage in paperback, is the subject of nation-wide discussion. His collection, Morning Poems (Harper Collins), named for William Stafford’s practice of writing a poem each morning, revisits the western Minnesota farm country of Bly’s boyhood with marvelous wit and warmth. He has recently published The Maiden King: The Reunion of Masculine and Feminine (Henry Holt) in collaboration with Marion Woodman. His new selected poems, Eating the Honey of Words, has recently appeared from Harper Flamingo, as well as his translations of Ghalib, The Lightning Should Have Fallen on Ghalib (with Sunil Dutta) from Ecco Press. He has also edited the prestigious Best American Poetry 1999 (Scribners).